I can’t wait until next year’s High Country Women’s Cycling Festival to be held in Bright Victoria in March 2019. Unfortunately I missed the inaugural last month, because the date clashed with the Blayney to Bathurst weekend. So I asked the brainchilds of the event Clare and Michelle to tell me a bit about it so I could share with you all. For those who don’t know about Bright in Victoria’s beautiful high country, it’s a cycling mecca. There’s lots of road riding options for climbers and plenty of bike paths on flatter ground. There’s also lots of mountain bike trails for those who like to head off road. Q: Where did the idea for the High Country Women’s Cycling Festival (HCWCF) come from? Why did you run it? The concept was developed by Clare Holdsworth and Michelle Armstrong, two women with a passion for sharing their cycling experiences and bringing cyclists, and in particular women, together to ride. The concept we ran with was – a celebration of women’s cycling, with a focus on fun, fitness and friendship, which will inspire, encourage and support more women to ride. Michelle Armstrong lives and breathes cycling and outdoor adventure, based out of Wangaratta, Victoria – the HCWCF is in her backyard. Clare Holdsworth is based in Melbourne, organises cycle tours in north east Victoria, she helped develop the 100 Women’s Cycling Stories project. Together Clare and Michelle worked with government and passionate local partners to deliver the inaugural HCWCF. From the moment they launched the idea in November 2017 engagement with key audiences via social media (Instagram/Facebook) and Mailchimp database, was strong. Regular e-newsletters to generate interest and keep the communication lines flowing, was an important item in the comms toolkit. And the best bit – women cyclists told us from the outset that they love the idea, with registrations coming in from all over Australia. It’s hard to describe that feeling of elation and relief, when we received our first registration and realised that our idea had turned into a beautiful reality. Just shows you what happens when women encourage and support one another’s ideas, harness their self-belief and embrace technological opportunities and challenges. Q: How long did it take to plan it? We started the funding application process in March 2017, and worked consistently at securing funding, sponsorship, developing a website and creative elements; designing a marketing/comms campaign and coordinating all the operation/logistical aspects of a cycling event. It required a time input of around 2 days/week for 9-10 months. Q: Tell me about the activities that you had at the Festival. Besides the Buffalo Women’s Ride, the signature event of the Festival (Sat 21/4), the program included a Bike Expo; Lycra Lunch Party (with Fashions on the Field) at Punka Pub; Celebratory Dinner with Guest Speakers at Bright Brewery; Bike Tech session at CyclePath Bright; Hot Yoga at Bright BootCamp and Sunday Ride – Falls Creek with Fondo. Q: How many women attended? Did they come from far and wide? Initial expectations were that the inaugural HCWCF 2018 would attract 100-150 women (plus their families) predominantly from Victoria. This outcome was achieved with the event selling out a week in advance, having achieved the maximum of 150 participants. Audience reach well exceeded expectations with registrations coming in from all over Australia – Broome, Darwin, South Australia; Queensland, Victoria, NSW and regional Victoria. Q: What was the feedback about the weekend like? The feedback from the event was overwhelmingly positive. Formal post-event evaluation was conducted via Survey Monkey, comments were received via social media channels and emails of thanks were received from participants, sponsors and partners following the event. We have had lots of participants asking for 2019 dates, as they want to lock in holidays and accommodation! 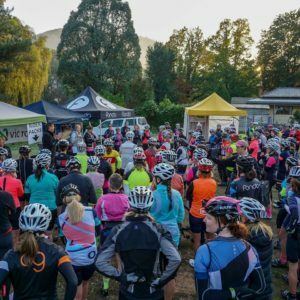 The feedback showed that participants thought it was a very special, unique event that delivered a safe, enjoyable and challenging ride plus ancillary activities, that were perfectly designed for the female cyclist. The atmosphere of camaraderie, support and inclusiveness, was unlike anything us, as organisers, had every witnessed and we were so appreciative that participants fully embraced the spirit of HCWCF that we had set out to create. One of our hashtags was #funfitnessfreindship and we think that beautifully captures the essence of the Festival. Q: Will you be running it again? If so, when? Yes absolutely! We are looking at end March 2019 but will make an announcement in the coming weeks. Keep an eye on the High Country Women’s Cycling Festival Facebook page. WWC would love to hear from any women who attended the High Country Women’s Cycling Festival. Share via comments or the Women Who Cycle Facebook page.